Jon Hamm Addresses All The Hullabaloo Over His "Manhood"
How do you know when you've made it in the entertainment biz? It's not a coveted star on the Walk of Fame or even a shiny statue for your mantle — these days, it's about an entire social media account dedicated to you. And, it's more than just Jon Hamm's mug that's making tabloid and blog readers gawk. For those of you who steer clear of celebrity gossip, we'll put it in layman's terms: The dude's anatomy is apparently so pronounced, there's a Tumblr titled Jon Hamm's Wang. 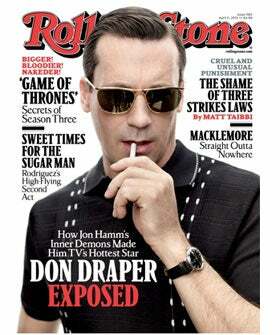 In his latest Q&A with Rolling Stone, the Mad Men actor addresses the rumors that his manhood has caused a stir on set. "They're called 'privates' for a reason," he says, adding, "I feel like that wasn't part of the deal. But whatever. I guess it's better than being called out for the opposite." And, while there are many other talking points in the feature (like shared similarities with his whiskey-loving character), the fact that Hamm has no issue smoothing over the crotch commotion makes him even more likable — imagine that!